I have read many fantasy books over the years, many of them mediocre, and few as captivating as George R.R. Martin’s now-ubiquitous A Song of Ice and Fire. So it was refreshing and thrilling to discover a trilogy that’s nearly as good: Chronicle of the Unhewn Throne, one of the best fantasy book series I’ve ever read. OK, I didn’t discover it—Kirk told me about it. Whatever, man. Chronicle of the Unhewn Throne, written by Brian Staveley, is a trilogy that takes place in a large fantasy world full of knights, wizards, and walking gods. Like many fantasy book series, it barrages you with terminology, offering a steady stream of proper nouns like “Kettral” and “Meshkent” and “Ashk’lan.” Unlike many fantasy book series, it ties all those nouns together in a considered, compelling story, expanding its scope while rarely meandering or losing momentum. Put another way: Once I started reading, I never wanted to stop. The series begins with the death of an emperor, and focuses on his three children: Kaden, isolated in the mountains and training to be an emotionless monk; Valyn, away on some islands training to be a lethal assassin; and Adare, who remains in the capital city, dealing with political machinations and the ramifications of her father’s death. Chapters alternate between each character’s perspective, A Song of Ice and Fire-style, allowing the reader new glimpses into the heroes’ internal monologues every time. Like George R.R. Martin, Staveley tries to make each chapter into a semi-self-contained story, with its own themes, threads, and tantalizing cliffhangers. He has a real knack for prose, and his writing is evocative without bogging down the reader with too many details. Staveley is also adept at world-building, and his fantasy kingdom is full of style and culture. There are monks who devote themselves to an existence free of emotion, nobles born with eyes that burn with awe-inspiring flame, and priests who serve the god of death by killing as many people as they can, yet live together in a pretty chill farming community where they all lounge around eating plants. It’s a world that feels real yet outlandish, and it’s one I loved spending time in, as awful as some of the events of Unhewn Throne actually are. 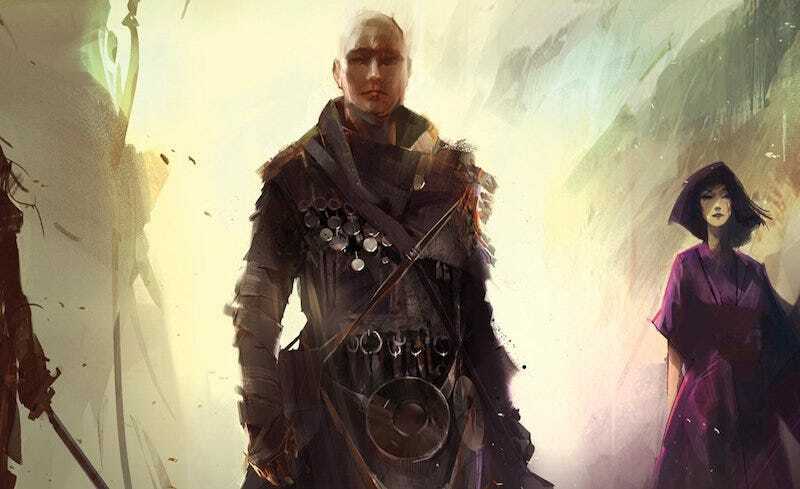 The first book (“The Emperor’s Blades”) gives short shrift to Adare, and Staveley initially makes some questionable decisions with his other female characters, but the second (“The Providence of Fire”) and third (“The Last Mortal Bond”) books correct those mistakes. By the end of the trilogy—which, you will be pleased to hear, is actually finished—the characters have all gone through horrible, horrible things, evolving and growing along the way. Their journeys resonated with me in some ways I didn’t expect, and the story has some interesting things to say about love, pain, and what it really means to be human. Also, there’s a group of special ops who ride giant birds and use them to assassinate people, which is pretty much all you need to know.